The latest transportation reauthorization bill (MAP-21) removed the restriction permitting the use of seat belt interlock, but still prohibits requiring a seat belt interlock and a result of BMW's lobbying efforts on Capitol Hill. BMW came to NHTSA in October of 2012 asking that they be allowed to use a seat belt interlock to comply with NHTSA’s unbelted crash test standard. Yes, automakers have to build cars for the stupidity that is not wearing a seatbelt. BMW’s position was that if they could guarantee that people couldn’t drive their cars without a seatbelt one, they could do away with at least 7lbs worth of safety equipment and save 30,850-45,744 gallons of fuel per year. Oh, and people would have to wear their seat belt, always, and not die. Yes, this may defeat the whole Darwinian approach to genetic cleansing, but saving lives are important, even lives of people stupid enough not to wear a seat belt. 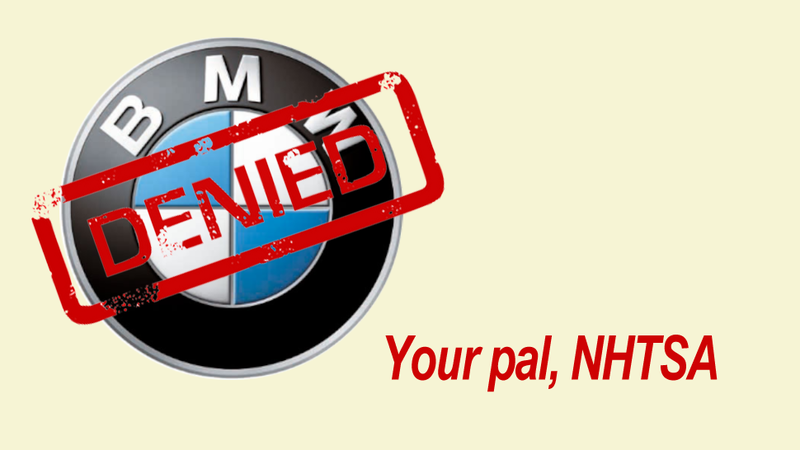 So what was NHTSA’s reasoning for denying the request? There you have it. The government does not want to do something unprecedented. Unprecedented is another word for innovative or even logical, that type of thinking shocks and scares a risk-averse government. It would appear that NHTSA can’t do this because it would appear like they’re stepping backwards in safety. Here we have a change that would cost the government no money and could result in seat belt use rates up to 100%, save hundreds if not thousands of lives, result in lighter cars that would save fuel and perform better, yet the government says NO. NHTSA’s main argument is that there there just isn’t enough data particularly as it relates to acceptance. Something tells me that while we’re more skeptical than ever about big brother and nannies (thank you NSA) we are a smarter society (in some respect, YouTube comments aside). This is one of those rare moments where it would appear that advocates for the environment, safety and performance could all agree. Maybe I’ve overlooked some large negative safety implication associated with this change, but on the surface it seems NHTSA’s decision is primarily based on a lack of data saying this will work, that this change will in fact save lives and not result in others being harmed. This is a valid concern as NHTSA should base their decisions on facts. And while BMW has promised to produce more data to support thier decision, for now we have a stalemate. NHTSA wants to protect the unbelted occupant. BMW wants to eliminate the unbelted occupant. We'll likely see more petitions like this in the future. As automakers use technology to reduce the chance of a crash, they'll leverage that fact as a justification to lobby for relaxed safety standards to help reduce weight, thus helping them reach fuel economy standards. And if you put this into the context of an autonomous vehicle world, 2020 if you believe Nissan, the question is very simple yet very complicated: If cars can’t crash do we need the same safety requirements?